Closeout!!! Few Sizes Left - Save Hundreds!! Top Pros and high performance riders world wide know the secret behind the RPM. The open C platform allows for fast riding, explosive pop with the correct amount of boost, travel and drift. This allow for aggressive moves with fast and solid landings. 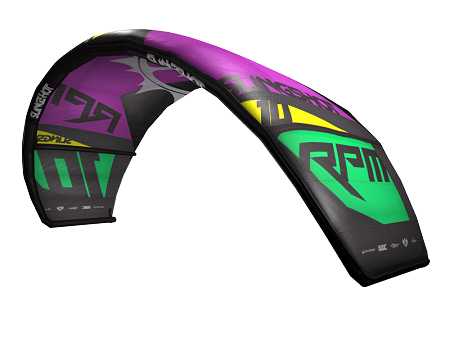 The new 2015 RPM builds on our proven legacy with a kite that rides faster, is more responsive, more crisp and more dialed in than ever before. Through years of testing and rider feedback, we have made new improvements and subtle refinements to set a new standard for performance and durability. Our new “Diamond Leech” technology improves air flow for “clean” air release off the trailing edge. 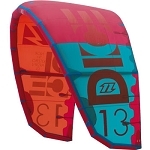 This feature improves aerodynamics, and is a major part of why the kite is faster, and has a new crisp feel. The Diamond Leech improved the over all stability of the leach. This significantly helps with wear and tear or flutter.